It’s rare to have good consistent weather here in the UK and although normally I have no problem spending time in the kitchen I do find it particularly difficult on sunny days. The beauty about this attractive Lemon and Blueberry Cheesecake is that you can freeze it. I suggest making a couple of them in advance, as it keeps well in the freezer and that way after a long days escapade soaking up some of the sun’s rays all you have to do is open the fridge door and wellah, dessert is done. Bursting with fresh fruity citrus flavours, a charming soft body and crunchy biscuit like base – served in the garden with family or friends… a perfect end to a lovely summer’s day. 8oz of frozen organic blueberries, plus a handful of blueberries to garnish. To make the crust: process the dates, almonds, salt and quinoa in a high speed blender until it resembles a crumb base. You may need to add a little water (but don’t over do it) until the mixture becomes sticky. Press into the bottom of a spring form pan and put in the freezer. To make the lemon layer: blend the cashews and honey/maple syrup in a blender until you get a smooth cheesecake consistency. Reserve 1/4 of this mixture for the blueberry topping. Place the rest back into the blender and add the lemon juice, blend until combined then mix in the lemon zest. Pour onto your crust and place back into the freezer. To make the blueberry layer: blend the blueberries with the reserved cheesecake mixture in your food processor until creamy. If desired add a handful of whole blueberries and combine by hand. Spread this over your cheesecake base and keep in the freezer overnight or for at least a couple of hours. I suggest waiting a day before serving, as it will deepen the flavours of the fruit. When ready to serve leave to thaw for about 20 minutes. 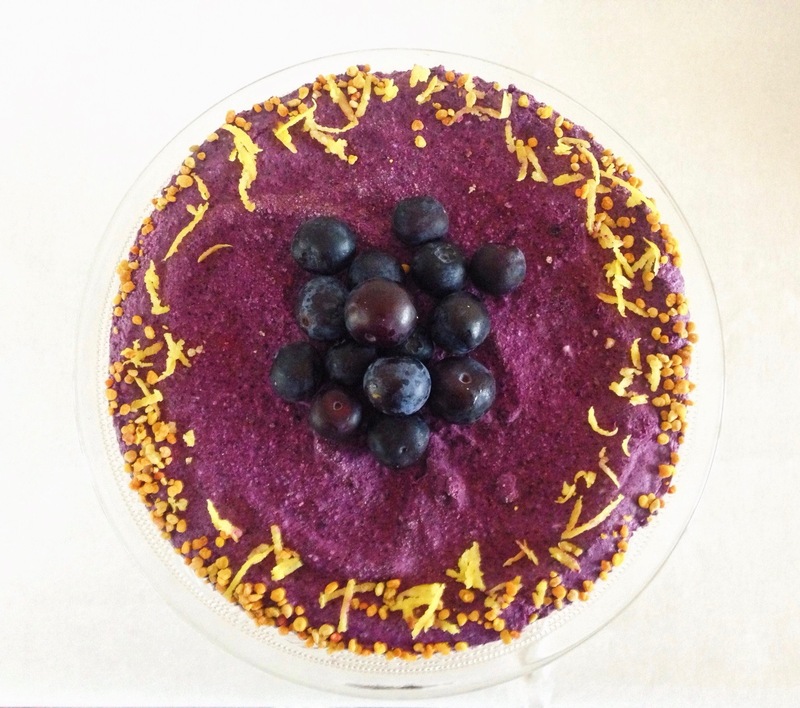 This entry was posted in Uncategorized and tagged blueberries, Cake, cheesecake, dairyfree, lemon, raw, refined sugar free, Sugar Free, vegan. Bookmark the permalink.